Aim: To study the effect of 6 months yoga program in patients suffering from chronic kidney disease (CKD). Materials and Methods: Fifty-four patients with CKD were studied and divided into two groups (yoga group and control group) to see the effect of yoga in CKD. Patients in the yoga group were offered yoga therapy along with other conventional treatment modalities, while the control group was only on conventional treatment. Subjects in yoga group were trained to perform specific yogic asanas for at least 5 days a week for 40-60 min a day. Regular monitoring of blood pressure, renal function, requirement of a number of dialysis, and quality of life (QOL) indicators were done. Fifty patients (yoga - 25; control-25) completed 6 months follow-up. Results: In yoga group, a significant reduction of systolic and diastolic blood pressure, significant reduction in blood urea and serum creatinine levels, and significant improvement in physical and psychological domain of the World Health Organization QOL (as assessed by BREF QOL scores) were seen after 6 months. In control group, rise of blood pressure, deterioration of renal function, and QOL were observed. Poststudy comparison between the two groups showed a statistically significant reduction of blood pressure, nonsignificant reduction in blood urea and serum creatinine, and significant improvement in physical and psychological domain of QOL in yoga group as compared to control group. For subjects in yoga group, the need for dialysis was less when compared to control group although this difference was statistically insignificant. Except for inability of some patients to perform certain yogic asanas no adverse effect was found in the study. Conclusion: Six months yoga program is safe and effective as an adjuvant therapy in improving renal functions and QOL of CKD patients. Context: Chronic pelvic pain (CPP) is a common condition of women of the reproductive age group. It has a negative impact on a woman's personal health and quality of life (QOL). Practicing yoga has shown numerous benefits in various chronic painful conditions. Aim: To study the effects of yogic intervention on pain scores and quality of life in females of reproductive age group with CPP, on conventional therapy. Settings and Design: It is a follow-up, randomized case-control study done in a tertiary care hospital. Subjects and Methods: Sixty female patients of CPP in the age group of 18-45 years were randomly divided into Group I (n = 30) and Group II (n = 30). Group I received only conventional therapy in the form of NSAIDS and Group II received yoga therapy in the form of asanas, pranayama, and relaxation along with the conventional therapy for 8 weeks. They were assessed twice (pre- and post-treatment) for pain scores through visual analog scale (VAS) score and QOL by the World Health Organization quality of life-BREF (WHOQOL-BREF) questionnaire. Statistical Analysis Used: Repeated measure ANOVA followed by Tukey's test. P < 0.05 was considered significant. 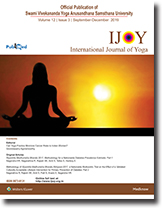 Results: After 8 weeks of yogic intervention, Group II patients showed a significant decrease in intensity of pain seen by a decrease in VAS score (P < 0.001) and improvement in the quality of life with a significant increase (P < 0.001) in physical, psychological, social, and environmental domain scores of WHOQOL-BREF. Conclusions: The practice of yoga causes a reduction in the pain intensity and improves the quality of life in patients with chronic pelvic pain. Background: Mobile phones induce radio frequency electromagnetic field (RF-EMF) which has been found to affect subtle energy levels of adults through Electrophotonic Imaging (EPI) technique in a previous pilot study. Materials and Methods: We enrolled 61 healthy right-handed healthy teenagers (22 males and 39 females) in the age range of 17.40 ± 0.24 years from educational institutes in Bengaluru. Subjects were randomly divided into two groups: (1) (mobile phone in "ON" mode [MPON] at right ear) and (2) mobile phone in "OFF" mode (MPOF). Subtle energy levels of various organs of the subjects were measured using gas discharge visualization Camera Pro device, in double-blind conditions, at two points of time: (1) baseline and (2) after 15 min of MPON/MPOF exposure. As the data were found normally distributed, paired and independent samples t-test were applied to perform within and between group comparisons, respectively. Results: The subtle energy levels were significantly reduced after RF-EMF exposure in MPON group as compared to MPOF group for following areas: (a) Pancreas (P = 0.001), (b) thyroid gland (P = 0.002), (c) cerebral cortex (P < 0.01), (d) cerebral vessels (P < 0.05), (e) hypophysis (P = 0.013), (f) left ear and left eye (P < 0.01), (g) liver (P < 0.05), (h) right kidney (P < 0.05), (i) spleen (P < 0.04), and (j) immune system (P < 0.02). Conclusion: Fifteen minutes of RF-EMF exposure exerted quantifiable effects on subtle energy levels of endocrine glands, nervous system, liver, kidney, spleen, and immune system of healthy teenagers. Future studies should try to correlate these findings with respective biochemical markers and standard radio-imaging techniques. Aim and Objectives: This study was undertaken to evaluate the effectiveness of yoga on the mental health status of elderly women inmates residing in a hospice in Puducherry. Materials and Methods: Forty elderly women were randomly divided into yoga and wait-listed control group. A yoga therapy program of 60 min was given twice a week for 12 weeks. This protocol was specially designed for senior citizens, keeping in mind their health status and physical limitations that included simple warm-up and breath-body movement coordination practices (jathis and kriyas), static stretching postures (asanas), breathing techniques (pranayamas), and relaxation. Hamilton anxiety scale for measuring anxiety, Hamilton rating scale for depression, and Rosenberg self-esteem scale to measure self-esteem were administered to both groups before and after the 12-week study period. Data were assessed for normality, and appropriate parametric and nonparametric statistical methods were applied for intra- and inter-group comparisons. Results: Overall, intra- and inter-group comparison of prepost data showed statistically significant (P < 0.001) differences for all three parameters. There was an overall improvement in the scores indicating decreased levels of depression and anxiety coupled with an increase in the level of self-esteem after the yoga therapy program. Discussion: The influence of yoga in the reduction of depression and anxiety scores and improvement in self-esteem scores in elderly women subjects is evident from this study. As reported in earlier studies, this may be attributed to changes in central neurotransmitters such as gamma-aminobutyric-acid coupled with increased parasympathetic tone and decreased sympatho-adrenal activity. Conclusion: It is recommended that yoga should be a part of health-care facilities for elderly as it can enhance the quality of life by improving their overall mental health status. It could provide a healthy and positive alternative from depressing negative thoughts, and give them a sense of purpose and hope. Aim: To study the adherence to yoga and its effects on blood glucose parameters in patients with Type 2 Diabetes Mellitus. Methods: A single group longitudinal study over 6 months was conducted at VASK yoga centre, Bangalore. Fasting Blood Sugar, Post Prandial Blood Sugar Levels and Glycosylated Hemoglobin and qualitative in-depth interview of the participants and therapist was conducted at baseline, end of 3 rd month and end of 6 months; intermediate observations was conducted at the end of every month. Results: Adherence to yoga in the community in Bangalore is around 50% over 6 months. Participants who completed the yoga programme had significantly lower HbA1c (end of 3 rd month). At the end of 6 months yoga adherence was significantly negatively correlated with FBS and stress. Further there was a trend towards those who dropped out having higher FBS, controlling for medication intake, stress levels and diet pattern (OR = 1.027, P = 0.07). Qualitative data revealed that most of the participants joined and completed the yoga programme to help cure their diabetes. Participants who dropped out from the yoga programme gave reasons of travel, ill-health and increased work-load at office. Conclusions: Adherence to yoga has an effect on the blood glucose parameters in diabetes. Hence, strategies to motivate participants to undergo 'lifestyle modification practices' including maximizing adherence to yoga should be the focus to experience any beneficial effects of yoga. Background: "Learning styles" has captivated a great deal of attention in yoga teacher training. The triad of visual, auditory, and kinesthetic learning styles has been particularly popular; yet as Sharp et al. asserted, such an approach trivializes the complexity of learning and compromises scholarship at all levels of the education community. Aims: This paper addresses that although there is great merit in recognizing yoga students' differences and preferences, many uses of learning styles in yoga teacher training are superficial and promote self-handicapping. Conclusion: A somatic perspective (from soma, the body in its wholeness) offers a framework to reconsider the depth of effective learning. Geriatric orthopedic problems poses different challenges in their management. Conventional treatment methods like drugs, physiotherapy and surgeries are inadequate. A Geriatric orthopedic patient suffers as a whole and not in isolation. This article highlights the importance of managing geriatric orthopedic patients as a whole and outlines the various steps of wholistic management. Objective: The objective of this study is to assess the awareness and practices of complementary and alternative medicine (CAM) for oral health-care management among dental students. Materials and Methods: A cross-sectional study was conducted in 200 dental students of final year and internship selected by simple random sampling using a close-ended questionnaire. Results: Among the total respondents, 52% were females and 48% were males. Nearly, 14% of the students were not aware of the different categories of the CAM and 12% of them were not aware of its implication in oral health-care management. Conclusion: Majority of the students was aware of CAM, yet they do not follow the use of the same for their patient's oral health-care management. Hence, a small provision regarding the knowledge of CAM should be imposed under the undergraduate curriculum for the dental students so that it should be implemented in their practice in future. A 23-year-old female with a past medical history of gastroesophageal reflux disease presented with shortness of breath induced by exercise and certain odors. She reported the symptoms of autonomic dysfunction including fatigue, chest pain, lightheadedness, headaches, numbness/tingling in the arms and legs, and exercise intolerance. Vital signs were significant for orthostatic intolerance. Volume flow loop in the pulmonary function tests showed a flattening of the inspiratory portion characteristic of vocal cord dysfunction. Laryngoscopy showed dyskinesia of the left vocal cord, especially after exercise. Multifactorial approach was used including increased fluid intake and breathing exercises. After 6 weeks of breathing and isometric exercises, the patient reported improvement in dyspnea after exercise. This case report demonstrates the therapeutic role of breathing and isometric exercises in the management of vocal cord and autonomic dysfunction.